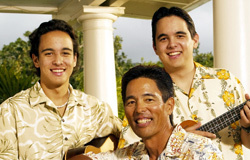 A Family band that was formed in 2005 in Hawaii. “DNA” stands for Dad, Nick and Alex and yes, it is all in the genes. Original compositions “Discover Aloha with me” and others were featured as the Hawaii Tourism Japan campaign songs since 2008 and quickly become hits in Japan. “Aloha you -Kizuna-” a Japanese song that was featured as the song of the month in April and May on NHK TV program called “Minna no Uta” and has been attracting many fans. Manoa DNA, the newest and hottest of Hawaii’s bands, is a “family affair” comprised of Dad, Lloyd Kawakami, and his two sons Nick and Alex. Residing in Manoa and taking the first initials of their names, Manoa DNA was formed in 2005. They create contemporary Hawaiian music with high energy and intense harmony. Their music consisting of a 12 string, ukulele and guitar along with their harmony will excite and entertain spectators. Manoa DNA, the newest and hottest of Hawaii’s bands, is a “family affair” comprised of Dad, Lloyd Kawakami, and his two sons Nick and Alex. Residing in Manoa and taking the first initials of their names, Manoa DNA was formed in 2005. Born from the same gene pool and with the help of their manager and mom, Carla, the group creates contemporary Hawaiian music with high energy and intense harmony. They have been appointed by Hawaii Tourism Japan, the marketing arm of Hawaii Visitors and Convention Bureau in Japan, to sing “Discover Aloha With Me” in Japan’s TV commercials for the 2008 “So Much More Hawaii” Campaign. Please look forward to the performances of Manoa DNA at the 14th Annual Honolulu Festival. Their music consisting of a 12 string, ukulele and guitar along with their harmony will excite and entertain spectators during the event.